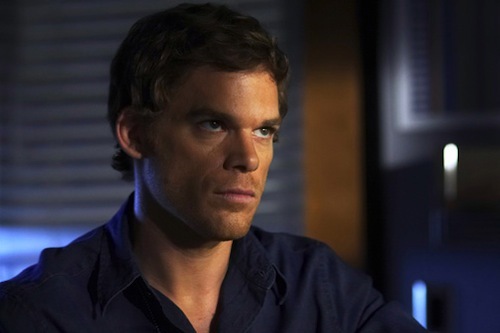 Michael C. Hall appropriately glowers as serial killer Dexter Morgan. Citing its killer ratings and critical acclaim, Showtime has renewed America's favorite -- and only -- serial killer drama for fourth and fifth seasons. That would be Dexter, currently in its third season as the pay cable network's all-time biggest draw. Last month's season premiere "surpassed three million viewers," says Showtime. That's a monster hit for a network that until recent years was hard-pressed to attract even one million watchers of anything it aired. Michael C. Hall, who came to fame in HBO's Six Feet Under, stars as Dexter Morgan, described in a Showtime publicity release as "a complicated and conflicted blood-spatter expert for the Miami police department who also moonlights as a serial killer." Showtime entertainment president Robert Greenblatt says, "I thought at best we would attract a devoted cult audience but soon realized that ironically this show is so thematically rich and layered with humanity that audiences of all kinds have flocked to it." Just don't imitate Dexter at home -- or anywhere for that matter. Seasons 4 and 5 each will have 12 episodes. On a decidedly lesser note, NBC has given its new Knight Rider series a full-season order. ***Dan Rather will be back in the saddle on election night. His home on the range is Dallas Mavericks owner Mark Cuban's HDNet, which will offer live coverage of the Nov. 4th reckoning day between Barack Obama and John McCain. Start time is 6 p.m. (central), with Rather joined at Washington, D.C.'s Newseum by campaign strategists Donald Fowler, Jr. and Todd Harris. "This coverage will be different than what the mainstream media will be offering," Rather says in a publicity release. "We'll go beyond the numbers and soundbites to discuss the projections for the evening and what the results will mean." Actually, the other guys will be doing that, too. But Rather has the great equalizer in any "Dan-isms" he might put in play. On Election Night 2004, Rather either regaled or repulsed CBS viewers with one-liners such as "This race is hotter than a Times Square Rolex" and "Bush is sweeping through the South like a big wheel through a cotton field." He otherwise anchors the weekly Dan Rather Reports on HDNet. Meanwhile, The CW is priding itself on being "the only network airing regular programming on election night." Namely, that's "shortened" new episodes of 90210 and Privileged, each of which will make room for two "local election updates." The CW's release is headlined, "It's the Programming, Stupid." Or, perhaps more to the point, "It's the Stupid Programming." ***Country Music Television (CMT) intends to capture the true meaning of the holiday season with Larry the Cable Guy's Star Studded Christmas Extravaganza. You can either watch this 90-minute "throwback to the old-school holiday variety show" on Nov. 21st or buy it to treasure and keep when the DVD hits stores just three days latter. Larry's scheduled guests include Terry Bradshaw, Toby Keith, Jeff Foxworthy, Bill Engvall, Lewis Black, Tony Orlando, Joey Fatone, Fred Willard and North Texas' own Terry Fator, the ventriloquist who won last year's America's Got Talent on NBC. VH1 aired L the C's Christmas show last year.